Here's What You Can Expect This Winter Across the U.S.
Winter typically puts a sudden end to all of the outdoorsy fun associated with fall foliage, but it turns out you might not need to spend the forthcoming icy season in a cocoon of blankets reading dreary novels. 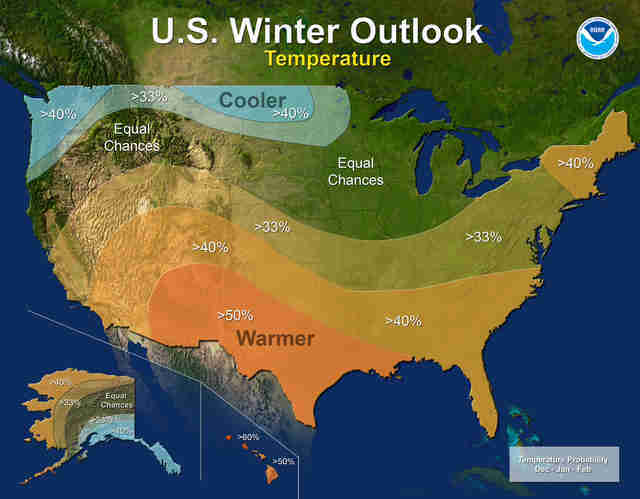 The emergence of a La Niña system for the second year in a row could end up spoiling your plans to hibernate this winter with warmer weather, according to NOAA's most recent 2017-2018 winter forecasts. 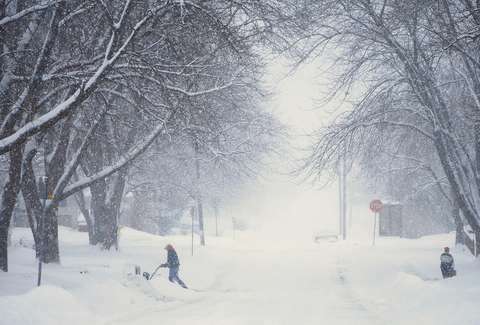 But the prospect of a warmer winter changes depending upon where you live. 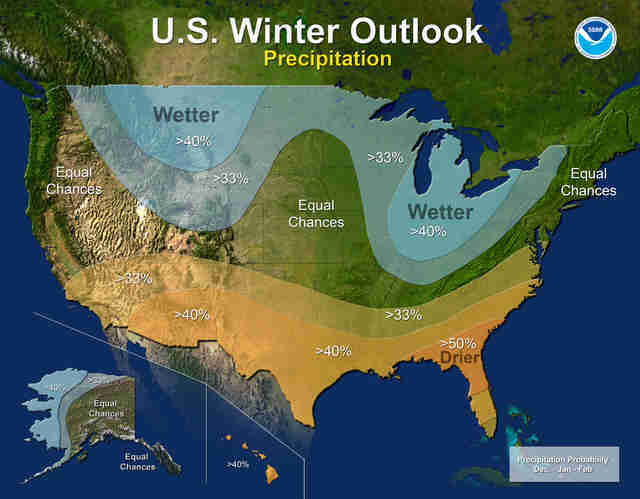 As the weather agency suggests, wetter and colder than average conditions are supposed to prevail across the northern United States, while a drier, toastier season is primed to set in across much of the South. Winter is shaping up to be a season of opposites, at least in terms of regional temperatures. This is all incumbent upon the La Niña system, which has between a 55% to 65% chance of forming before winter actually starts. Wetter conditions are expected to extend "from the northern Rockies, to the eastern Great Lakes, the Ohio Valley, in Hawaii and in western and northern Alaska," according to NOAA's projections, while colder temperatures should abound from the "Northern Tier of the country from Minnesota to the Pacific Northwest and in southeastern Alaska." Basically, this winter is expected to be like winter, but it could end up being even colder and snowier than usual in many parts. Sorry, Minnesota. The situation will be a little bit different on the East Coast, as the warmer air is set to waft up from the south and pervade much of the otherwise wintry conditions you'd expect. According to CNN, the East Coast has between a 33% and 40% chance of experiencing a warmer winter, which still leaves plenty of room for blustery, unforgiving days. Hawaii and western and northern Alaska are also set to experience warmer weather than usual. Despite the projections, large swaths of the country have a strong chance of experiencing a pretty normal winter. NOAA classifies these regions as "Equal Chances." They "have an equal chance for above-, near-, or below-normal temperatures and/or precipitation because there is not a strong enough climate signal in these areas to shift the odds." If La Niña does emerge, we can expect very similar weather to last winter, which saw the phenomenon create disparate conditions throughout the country. But still, these predictions could change as winter draws closer. And never underestimate the power of a devastating cold snap.